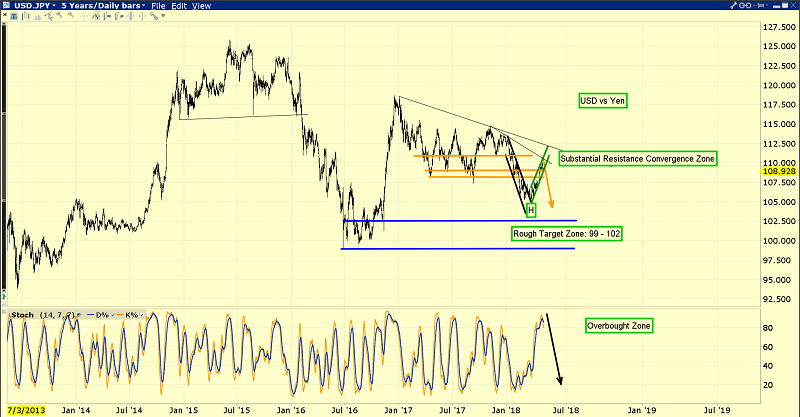 This is the daily gold chart. Gold has traded in a drifting rectangle pattern for most of this year. 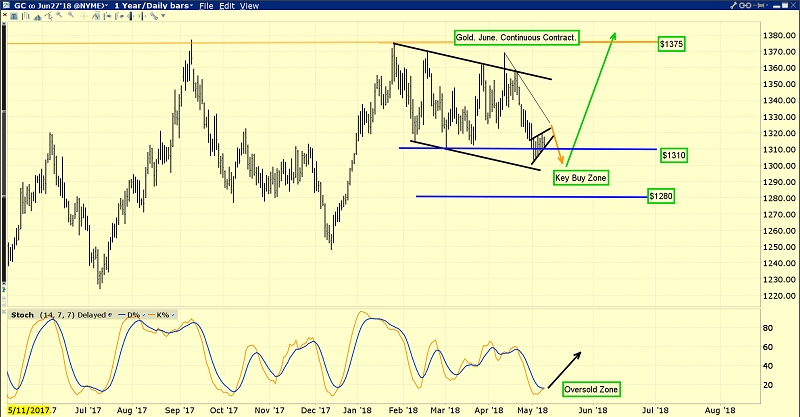 This is the important weekly gold chart. The rectangle pattern on the daily chart is part of a huge weekly chart base pattern. That has been forming for about five years. Note the enormous increase in trading volume over the past two years. This is extremely positive technical action. Trump appears ready to make an announcement concerning US government relations with Iran today. That could re-open the oil-for-gold trade in Turkey and other countries. It’s unlikely that anyone in China really cares very much about what the US government announces today, tomorrow, or in the future, and rightly so. In another five years it’s unlikely that anyone in India will care what the US government does either. This is the beginning of what I call the China and India oriented “gold bull era”. It’s an era that is rekindling respect amongst global money managers for gold as the ultimate asset and portfolio returns enhancement tool. I’m adamant that the correct minimum amount of gold that should be held in a stock and bond portfolio to maximize returns is 20%. The ideal portfolio may be 30% bonds, 30% stocks, 30% gold, and 10% blockchain. Regardless, long term precious metals investors should ignore short term market noise and focus on the big weekly chart base pattern for gold. Note the price targets of $1500 and $1750. That’s where to book some profits and/or buy put options in expectation of a significant pullback in the price. This is the dollar-yen chart. Another bear market rally for the dollar is nearing completion. 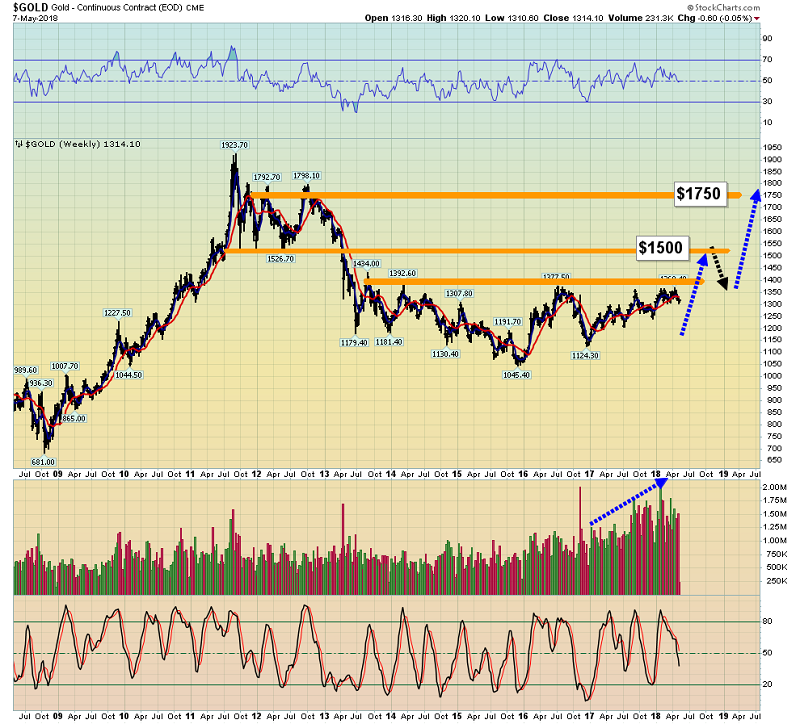 That bodes well for a gold price surge towards my first target at $1500. Most analysts claim the dollar is rallying because of rate hikes, but the cold truth is that the dollar has collapsed after almost every recent rate hike. I’m projecting this trend will continue and likely accelerate. If investors are racing to buy US bonds to get higher rates, why does this T-bond chart look like something the cat dragged in? Many investors are indeed buying bonds because of rate hikes, but the Fed’s QT program is countering their buying. All the mainstream media hype about higher rates and the dollar has produced nothing more than wet noodle rallies for both bonds and the dollar. It’s just a matter of time before more rate hikes and QT from Jay Powell push the T-bond under my 142 “line in the sand” zone. When that price zone fails, panic amongst institutional money managers could begin. That could usher in a substantial new leg down for the US stock market. "Some investors and institutions may not be well positioned for a rise in interest rates, even one that markets broadly anticipate, and, of course, future economic conditions may surprise us, as they often do." – Jay Powell, US Fed Chair, May 7, 2018. I believe the surprising economic conditions that Jay alludes to in that statement are going to be surprisingly inflationary. This is the GDX chart. Many Western gold mining stocks are trading at 1998 prices, and a large part of the problem relates to the deflationary collapse in US money velocity that began in 1995. A new era of inflation is beginning in the West. That is going to turn gold stocks into the kind of safe haven that bullion functioned as during the previous 1995 – 2014 deflationary era. 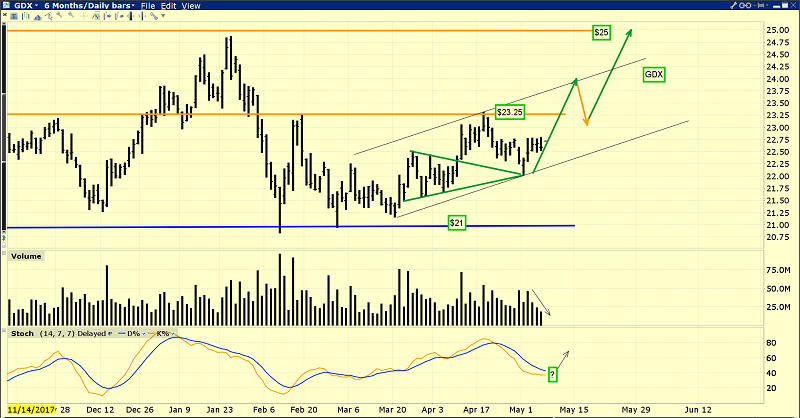 GDX is trading in a tight rough range between $21 and $23.25. 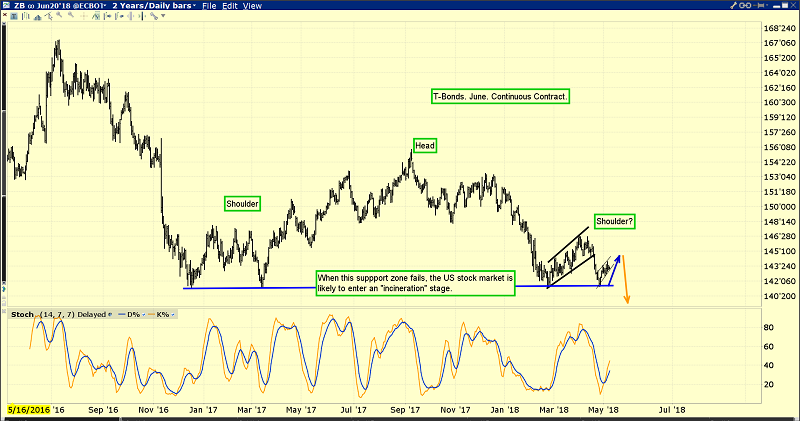 All inflation and bull era enthusiasts should be buyers of GDX and component stocks in this range. Use put options to manage emotional jitters. Aggressive traders can buy a two-day close above $23.25 with an initial target of $25, and this is likely the beginning of a much longer-term move that should see GDX rise to new all-time highs as gold reaches $1750. Special Offer For Gold-Eagle Readers: Please send me an Email to freereports4@gracelandupdates.com and I’ll send you my free “Gold & Silver Champions Of The World!” report. I highlight twelve of the best gold and silver stocks around the world that are in uptrends now and poised to accelerate those uptrends! I include tactical entry and exit points for each stock.